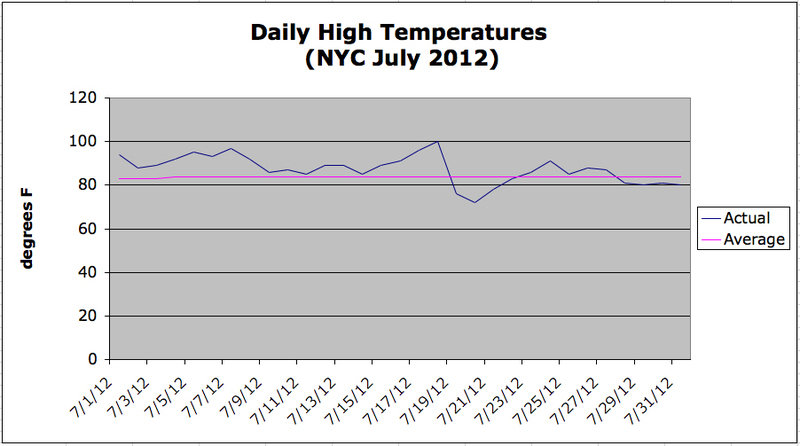 July is generally the warmest month on the calendar for New York City, and this year temperatures soared. We had ten days when the thermometer read 90°F or above, including July 18th when the mercury hit 100°F in Central Park. This extreme heat helped raise the city’s average monthly temperature to 78.8°F, which is 2.3°F above normal. In terms of precipitation this July, NYC experienced a number of severe thunderstorms, which brought much-needed rainfall to the area. In the end, however, the city only collected 4.21 inches of rain, which is 0.39 inches below normal. While not in a drought, it is interesting to note that the city has received below average precipitation for six out of the past seven months. This entry was posted in weather and tagged heat, nyc, stats, summer by Melissa Fleming. Bookmark the permalink.